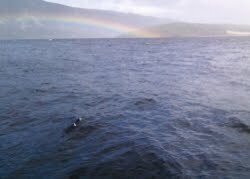 Back in September, a new photograph of Nessie hit the headlines as fish farm worker, Jon Rowe, took a snap of something unusual out in the water beyond the pier of the farm. I have previously discussed this event in two previous posts (here and here). Now being a website which believes in an exotic species of creature living at the bottom of the loch, nevertheless, we try and avoid being a "Never Nessie no matter what!" or an "Always Nessie no matter what!" kind of website. So we have something here for both skeptics and believers alike. Living relatively near Loch Ness, I headed up there back in October and visited the said fish farm just south of the village of Dores. I parked my car just outside the entrance and walked down the pathway to the locked gate (though it was an open site). Despite there being cars parked at the entrance, I could not find anyone there. I could hear a loud humming noise of machinery behind the trees but could get no one's attention. That was a pity as I had hoped to enquire after the whereabouts of Jon. At the end of the path, I could not proceed further due to health and safety regulations avoiding contamination of the site without wearing the right equipment or receiving the correct treatment (they don't like the salmon getting infected!). Nevertheless, there was plenty to see as my first photograph below shows. To compare this against the Nessie photograph shows we are in the same place as claimed by the witness. As I panned over to the main area of the fish farm, I noticed and photographed something that skeptics will no doubt make much of. The pier you can see is most likely where Jon took his photograph from but what is the small object floating just beyond the pier? 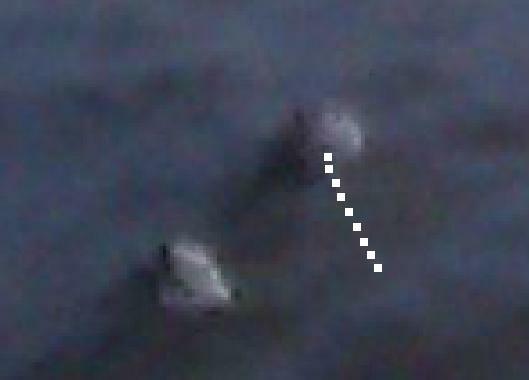 It's a buoy, of course, and skeptics will suggest that this (and presumably another buoy) were the objects actually photographed. Clearly, the thought did cross my mind, so I did a bit of analysis. 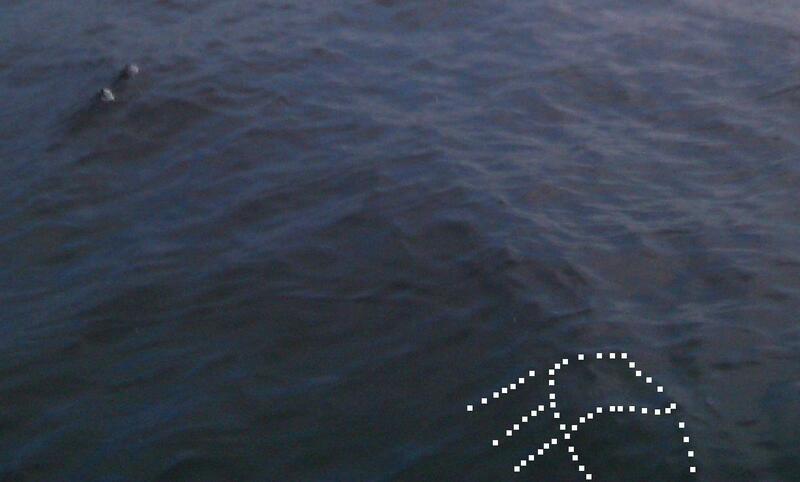 Here is a close up of the buoy and a close up of the "bumps" Jon photographed. Do the objects in the Rowe photograph look like the buoy in the upper photograph? Well, they don't to me but perhaps some skeptic can put up a convincing argument. I don't think they do, but in the interest of open debate, I put these pictures up for discussion. Comparing various pictures I took, I also thought the buoy was bigger than the two objects. But I said I had something for both sceptic and believer alike today. 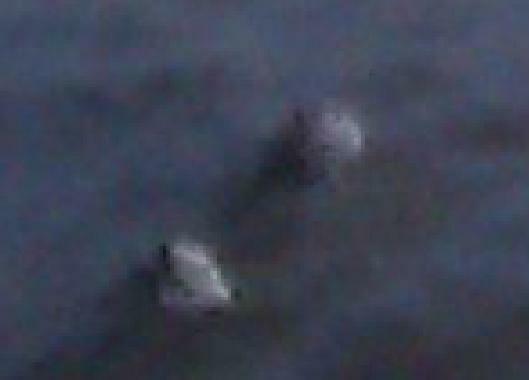 I have two further observations to make about the "bumps" photographed in September. Take another look at the uppermost "bump". You will have noted that there are various black dots on the surface of the two objects. However, it appears that from the centre dot (or perhaps orifice?) that there is some kind of fluid being ejected. I have annotated the ejecta line in the picture below. Make of that what you will. Some won't see it, some will. What it means if it is really there (and not an artifact of the image) is another matter. Some may think this revives the discredited "synchronising birds" explanation. Do birds pee upside-down? I would not have thought so (these systems have evolved to be gravity assisted!). However, on my second thought, two bumps suggest bilateral symmetry which suggests a lifeform. Another suggestion of something looking bilateral if visible further down the photograph. If you look at the bottom centre to right of the picture there is a curious oval-like structure which to me is not suggestive of wave interference but something ridge like and barely below the surface. The water around looks slightly raised as if pushed up by something underneath. The nearest analogy I could think of to demonstrate what I was seeing was something like the back of a crocodile (below). The perpendicular lines to the left of the item are the water waves rising and curving over this interesting piece of symmetry. Is it the back of the Loch Ness Monster? Judge for yourselves. But I better stop there as I am getting a bit cross eyed looking at the pixels of this picture! Who is John MacDonald, you may ask? Back on May 12th 1933, ten days after the first Loch Ness Monster article was printed in the Inverness Courier, the editor evidently favoured a second opinion in the form of Captain John MacDonald who had commanded several ships which had steamed their way up and down Loch Ness for nearly 50 years. Who better to ask about what sights may been seen on the loch surface, they may have thought. The Captain proceeded to solemnly declare that the Mackays were the victims of their stirred imaginations and had probably seen salmon at play in the waters. After all, he had embarked on nearly 20,000 trips on the loch and he had never seen a thing and he knew what he was talking about. He also dismissed any talk about a legendary creature being known about in the loch. Why is that? Because no one had ever told him about it! 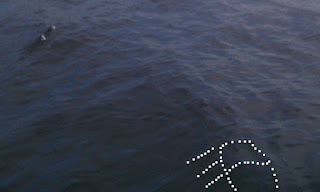 As it turns out, the tradition of a Water Horse in Loch Ness was well established. Ronald Binns in his sceptical book, reprints the entirety of the captain's letter and holds it up as an authoritative example of how to answer the "myth" that was to develop. As it transpired, this all turned out to be irrelevant as I was studying the archives and diaries of Cyril Dieckhoff in Edinburgh recently. Our erstwhile monk and monster hunter had kept various newspaper clippings and an undated one from the Daily Mail (probably after January 1934) proved most illuminating. The article also relates how his own daughter, Christina, claimed to have seen the Loch Ness Monster. So Captain MacDonald came to realise his 20,000 trips on Loch Ness counted for nothing in the grand scheme of things. The truth is that you can spend your entire life on the loch and never see the monster or you can see it within minutes of arriving for your first visit. 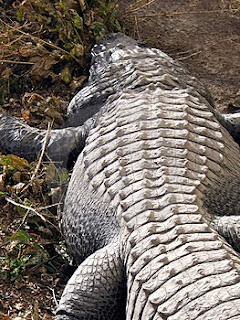 When you have a creature that spends almost its entire life in the silt at the bottom and sides of the loch, it is surprising that it puts in an appearance for anyone. But it does and the mystery depends on those who have seen it and not those who have not!